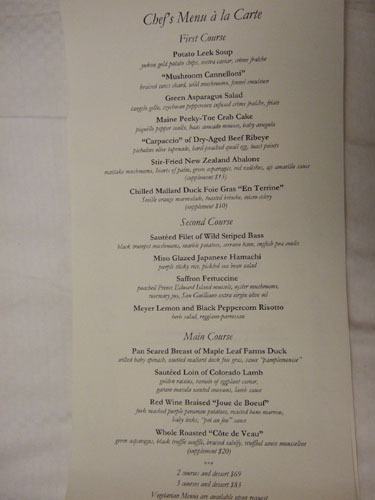 Of all the restaurants I researched in San Francisco, Masa's had one of the most interesting menus, so I just had to check it out. 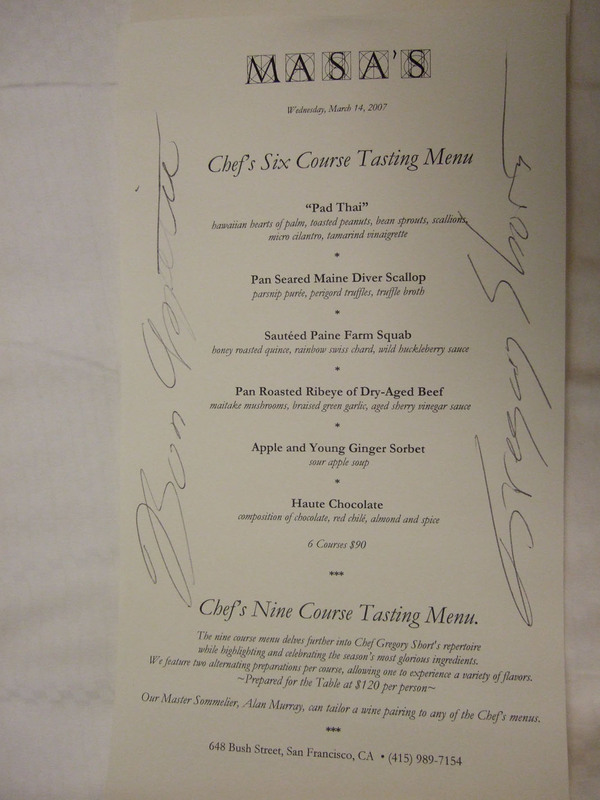 The fact that it was Michelin-rated with a French Laundry alum at the helm certainly didn't hurt either. The decor is minimalist, if not a bit stark. 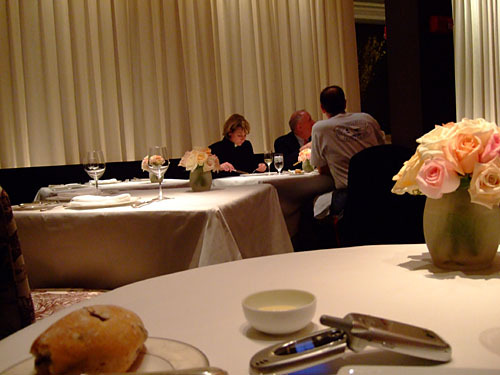 There is only one main dining room, with a small bar area near the entrance (behind the curtains). 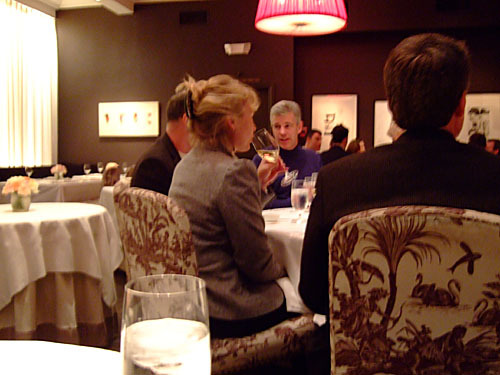 The à la carte and tasting menus. 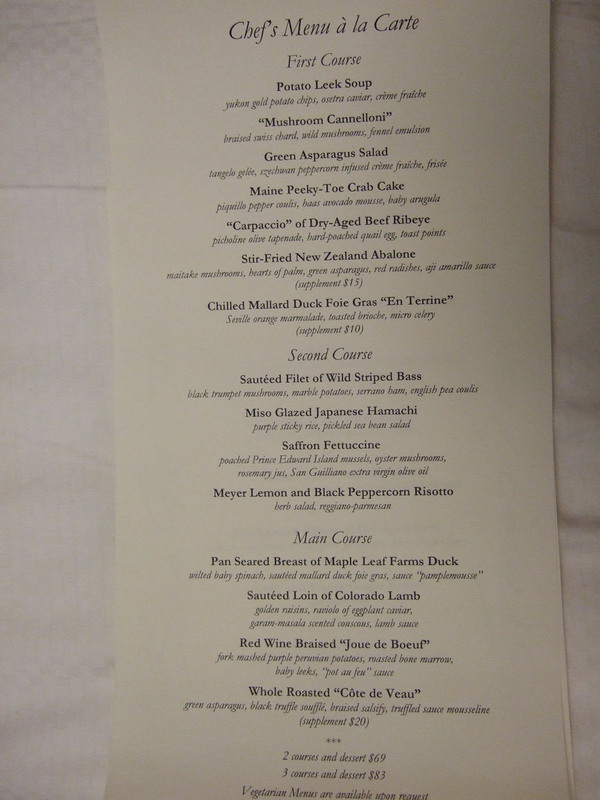 I went for the nine-course tasting menu, which contained a number of dishes from the à la carte menu. What's interesting is that the menu is offered in alternating preparations; I would've like to have seen what the alternate choices were. 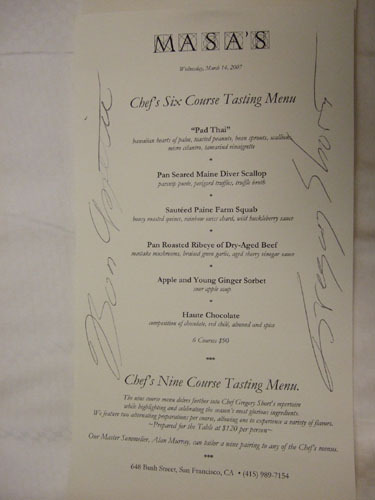 Note the signature of executive chef Gregory Short. Click for larger versions. 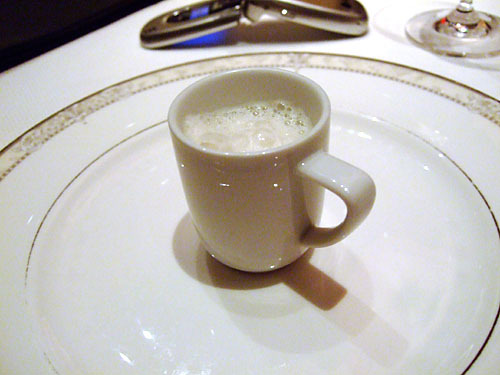 This was the first time I've had a "pre-amuse," basically something given right after I sat down. 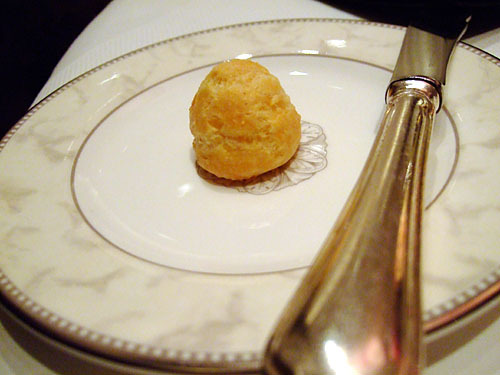 It was Jerusalem Artichoke Soup with Truffle Cheese Puff. For bread, raisin, olive, and sourdough varieties were offered. 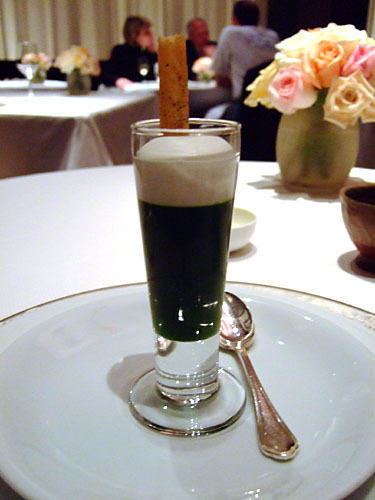 Arugula Gelée, Pear Foam. The gelée was interesting, and had a much greener tone than shown in the photo. 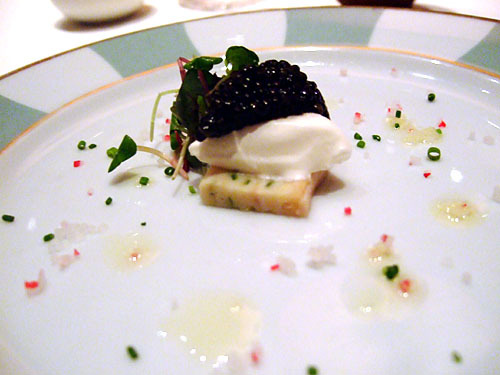 A generous dollop with crème fraîche, smoked sturgeon terrine, red radish, lemon oil. The saltiness of the roe and the creaminess of the crème fraîche formed a nice contrast. The sake was an unusual pairing (I'm used to Champagne or vodka), but worked out quite nicely. 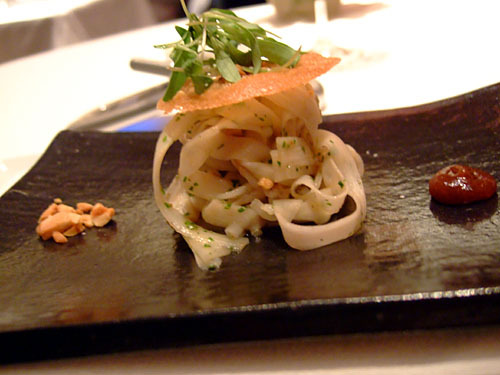 With Hawaiian hearts of palm, toasted peanuts, bean sprouts, scallions, micro cilantro, tamarind vinaigrette, peanut tuile. A fairly convincing interpretation of the ubiquitous Thai original, the "noodles" were actually made of the hearts of palm. Fantastic Riesling too! With parsnip purée, perigord truffles, truffle broth. 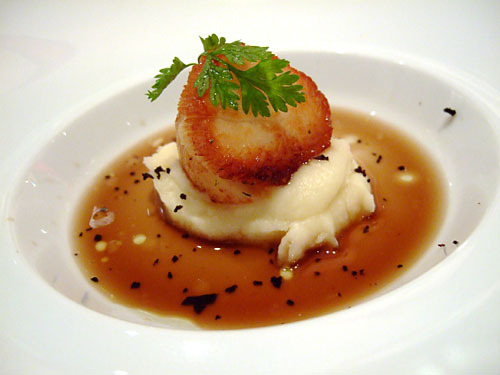 The truffle added some stronger flavors to the subtlety of the scallop. With purple sticky rice, picked sea bean salad. Hamachi is something I have extremely often at sushi restaurants, but I think this may have been my first experience with the fish cooked. I think I still prefer the raw variety, though this was quite tasty, especially with the purple rice. 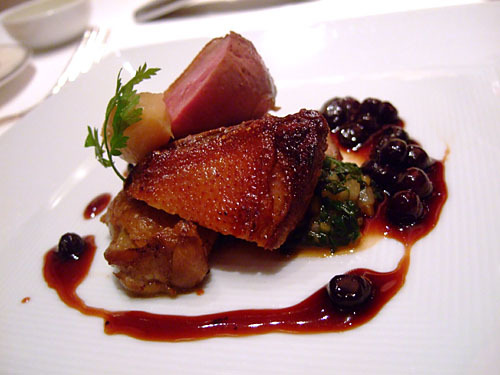 With confit squab leg, poached winter fruit, apple gastrique, frisée. 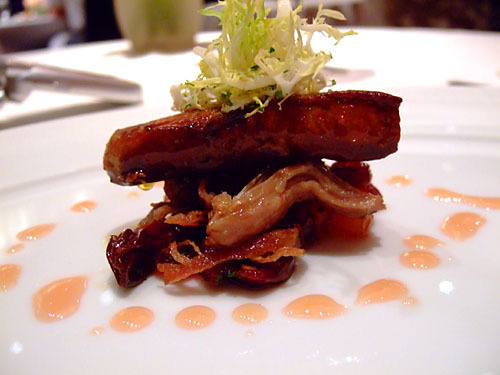 Nice piece of foie, made even better by the excellent confit underneath it. 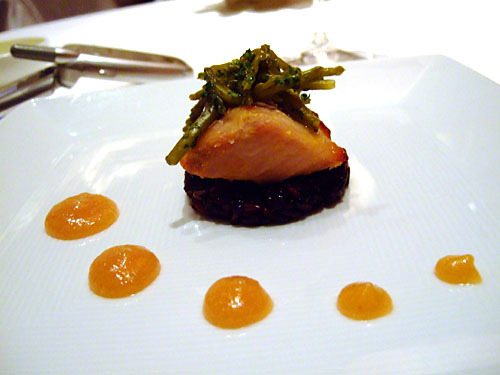 With honey roasted quince, rainbow swiss chard, wild huckleberry sauce. I usually love squab and this was no exception. I especially liked the skin. With maitake mushrooms, braised green garlic, aged sherry vinegar sauce. 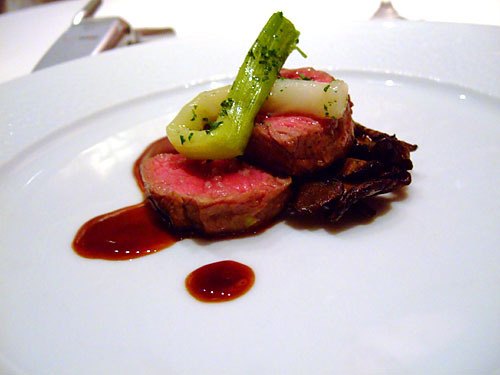 A great cut of beef, tender, yet flavorful, maybe the best cut of rib eye I've had ever. The Cab was a quintessential expression of the varietal. 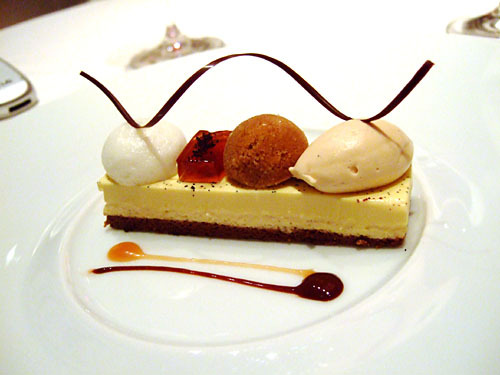 This was actually not part of the tasting menu but something that I requested to be added on. We have: Tête de Monde - Sheep, Lumiere Camembert Green Hill Georgia - Cow, Windsor Blue New Zealand - Cow, Midnight Moon McKinleyville California - Goat. 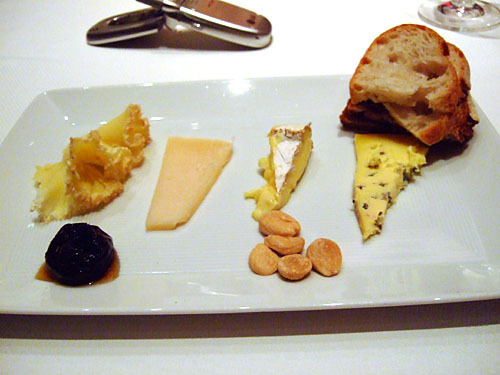 All were quite good, though my favorite was the camembert. With sour apple soup. The tartness of the apple and ginger made this incredibly refreshing. 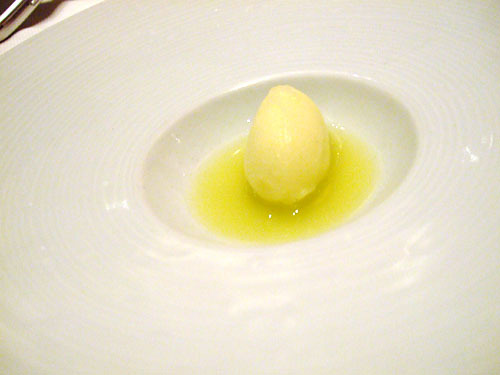 With sorbet, gelée, chicory ice cream. This may be the most beautiful dessert I've ever eaten. Stunning! 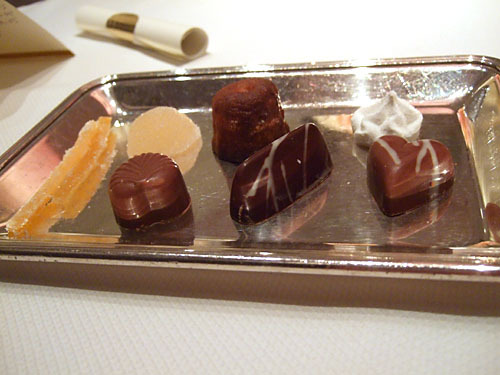 After dinner treats included lychee gelée, raspberry truffle, mint pyramid, and maple and mushroom truffle. There were actually many more varieties brought out on a fancy cart, which I wish I could've gotten a photo of. Collier, I did enjoy the meal here in fact. I do agree about the decor though--it was a bit dated. I'll look forward to your email.